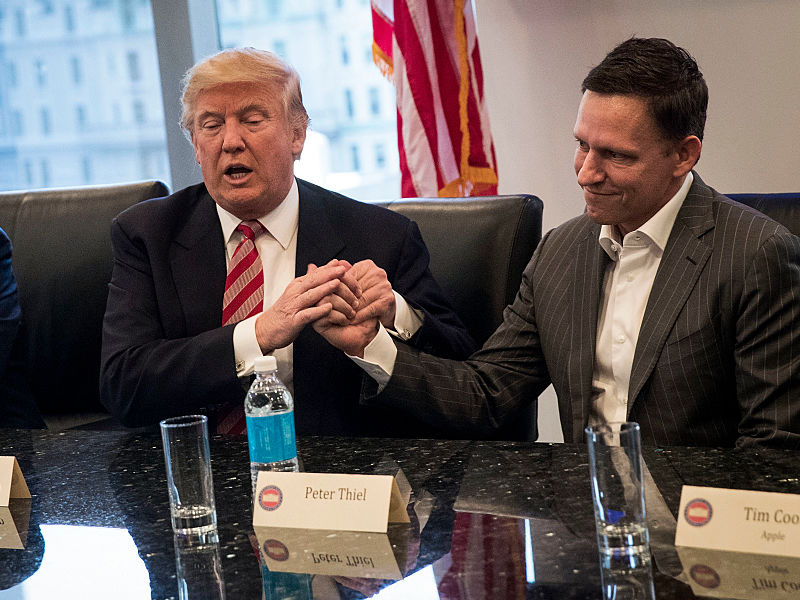 Drew Angerer/Getty ImagesPresident Trump and Peter Thiel in December 2016. Netflix CEO Reed Hastings reportedly offered to resign from Facebook’s board over his disagreement with Peter Thiel’s support of then-presidential candidate Donald Trump, according to The Wall Street Journal. Facebook CEO Mark Zuckerberg declined Hastings’ offer to resign. In August of last year, The New York Times reported that, in 2016, Peter Thiel’s support of then-presidential candidate Donald Trump caused friction among the members of Facebook’s board. Netflix CEO Reed Hastings – who called his fellow board member Thiel’s support of Trump “catastrophically bad judgment” in an email leaked to the Times – also offered to resign over his disagreement with Thiel, according to a Wall Street Journal report published Thursday. Sources told WSJ that Facebook CEO Zuckerberg declined Hastings’ offer to resign. Facebook declined to comment on the matter to Business Insider. Hastings and Thiel are both currently on the Facebook board, though, according to WSJ, Thiel is reportedly discussing “the possibility of resigning” from the board, and is scaling back his involvement in Silicon Valley. A vocal libertarian, Thiel has called Silicon Valley “a one-party state” and lamented the lack of a conservative presence in the tech industry. He also drew criticism from tech industry leaders when he served as an adviser on Trump’s transition team in 2016. The founder of PayPal and a prominent investor in Silicon Valley, Thiel is reportedly moving his investment firms Thiel Capital and Thiel Foundation out of the Bay Area and into Los Angeles this year, according to WSJ. In L.A., Thiel is also reportedly planning to build “a right-leaning media outlet to foster discussion and community around conservative topics.” Thiel bankrolled the lawsuits that eventually forced Gawker Media into bankruptcy, and has been trying to buy Gawker’s now-defunct flagship site.